CHICAGO (JULY 17, 2018)—The School of the Art Institute of Chicago (SAIC), a global leader in art and design education, launched a new online store featuring sleek branded apparel and gear befitting of a world-renowned art and design school. 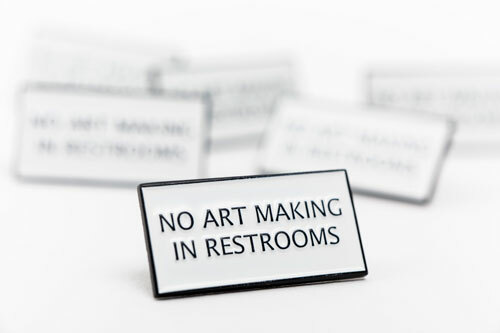 Top items from the collection include a monochromatic crewneck sweatshirt, beanie, travel mug and tote bag, as well as a “No Art Making in Restrooms” pin, a nod to campus signage that famously appears at the entrance to some SAIC restrooms. The canvas tote features a playful adaptation of the school’s logo printed around the side of the bag and across the seam, a technically challenging yet beautiful construction. “We wanted to do something a little unexpected that delivers the quality we teach our students,” said Hendrickson. Hendrickson also explained that the monochromatic black sweatshirt is a nod to SAIC’s unofficial school color. The entire line is an unconventional take on collegiate apparel, putting an art school spin on traditional designs. All products are available at saic.edu/store.